May You Be Sealed For A Good Year Ahead. Tuesday evening marked the beginning of Yom Kippur, the Jewish day of atonement, which Jews consider to be holiest day of the year. It’s marked by a day-long fast, repentance and prayer. Yom Kippur with Russkie Prostori. Due to this celebration we want to tell you some interesting facts about Jewish history and culture in Russia. The majority of Russian Jews are secular and identify themselves as Jews via ethnicity rather than religion although interest about Jewish identity as well as practice of Jewish tradition amongst Russian Jews is growing. There are several major Jewish organizations in the territories of the former USSR. The central Jewish organization is the Federation of Jewish Communities of the CIS under the leadership of Chief Rabbi Berel Lazar. Perhaps stemming from the now obsolete Soviet nationality policy, a linguistic distinction remains to this day in the Russian language where there are terms for “Jew”. The word Еврей (“Yevrey” – Hebrew) typically denotes a Jewish ethnicity, while the world Иудей (“Iudey” – Judean) is reserved for denoting a follower of the Jewish religion, whether ethnically Jewish or not. Have you ever heard about an Jewish autonomous region in Russia? It is called The Jewish Autonomous Oblast and situated in the Russian Far East, with population about 176 thousand people. It was established in 1934 as the result of Joseph Stalin’s nationality policy, which provided the Jewish population of the Soviet Union with a large territory in which to pursue Yiddish cultural heritage. According to the 1939 population census, 17,695 Jews lived in the region (16% of the total population). The Jewish population peaked in 1948 at around 30,000, about one-quarter of the region’s population.The census of 1959, taken six years after Stalin’s death, revealed that the Jewish population of the JAO declined to 14,269 persons. As of 2002, 2,327 Jews were living in the JAO (1.2% of the total population), while ethnic Russians made up 90% of the JAO population. Right now spiritual centers of Jewish people in Russia located in Moscow and St.Petersburg presented by famous synagogues in the country. 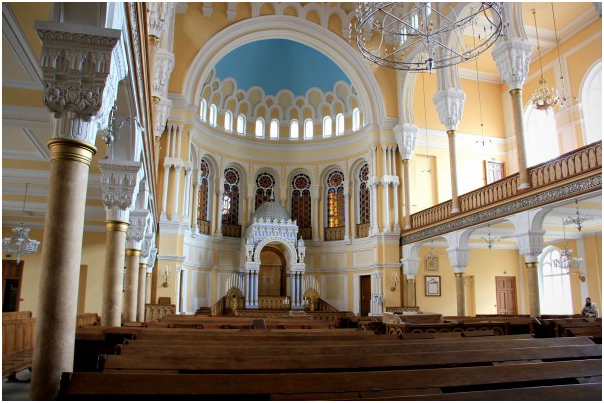 The Moscow Choral Synagogue is the main synagogue in Russia and in the former Soviet Union. It is located in central Basmanny District at 10, Bolshoy Spasogolinischevsky Lane, close to Kitai-Gorod Metro station. Rabbi Pinchas Goldschmidt is the spiritual head of this Synagogue. The synagogue is located close to the former Jewish settlement in Zaryadye. Moscow city authorities had officially banned synagogue construction inside Kitai-gorod, thus the synagogue was built one block east from its walls. The synagogue opened in 1906. It operated throughout the Soviet period, although authorities had annexed some parts of the original building for secular purposes (in 1923 and 1960). In October, 1948, Golda Meir, the first representative from Israel to the Soviet Union, paid an unauthorized visit to the synagogue to attend Rosh Hashana and Yom Kippur services, enraging the Soviet government. The synagogue has been recently restored. It is also known for the famous choir of Michael Turetsky. The Grand Choral Synagogue of St. Petersburg became the first synagogue in the city and one of the greatest by that time manifestation of Judaism in Russia. Building itself has a priceless cultural value – the spot of its construction and the architectural style were the subjects of high-pitched 10-year debates between eminent Jewish families, Saint Petersburg government, various artists and art critics. Eventually the synagogue was constructed at 2 Lermontovskii Prospekt in 1893 in Moorish Revival style with Byzantine and Arabesque motifs and it acquired not only religious but also political importance. And even now, after more than a century, that magnificent building is the main keeper of the Jewish heritage in Saint Petersburg as well as one of the most important Jewish cultural centers. The Grand Choral Synagogue is not the only place of Jewish community in Saint Petersburg. Yesod is the major health, cultural, educational and entertainment center in the city that houses plenty of Jewish communities and organizations. Every day it is attended by hundreds of Jews of all ages. Contact us and we will be happy to put you in touch with our Russian DMC.